Here are some of the best places to get a tasty portion of this classic dish in Yorkshire, according to TripAdvisor. Photos are for illustrative purposes only. Wetherby Whaler is a fish and chip restaurant and takeaway in West Yorkshire, which regularly has people queuing out of the door. They serve regular and large portions of fish and chips, alongside their Whaler GIANT Haddock. 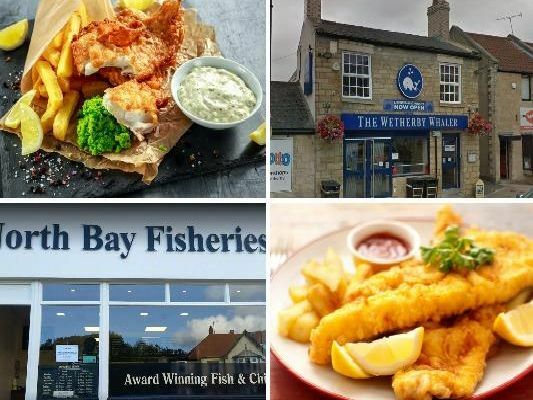 North Bay Fisheries also offer some of the best fish and chips in North Yorkshire. They offer large servings of freshly-caught fish, accompanied by a plentiful portion of perfectly cooked chips. Not to be confused with the seaside town of Whitby, Whitby's fish and chips shop in Doncaster is ranked number 1 in the South Yorkshire area. Whitby's has a takeaway and restaurant, which offer the option of gluten free batter. Mother Hubbard's, located on Leeds Road in Bradford, offers large portions of fresh and tasty fish and chips. The fish is of an extremely high quality and they offer a wide range of side orders.